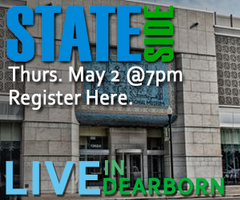 Michigan Radio's Stateside will head out of the studio on May 2nd for a live broadcast from Dearborn's Arab American National Museum. The Michigan-focused news magazine program features local experts, issues, and music. Join Cynthia Canty and the Stateside team for an evening of engaging conversation and entertainment.